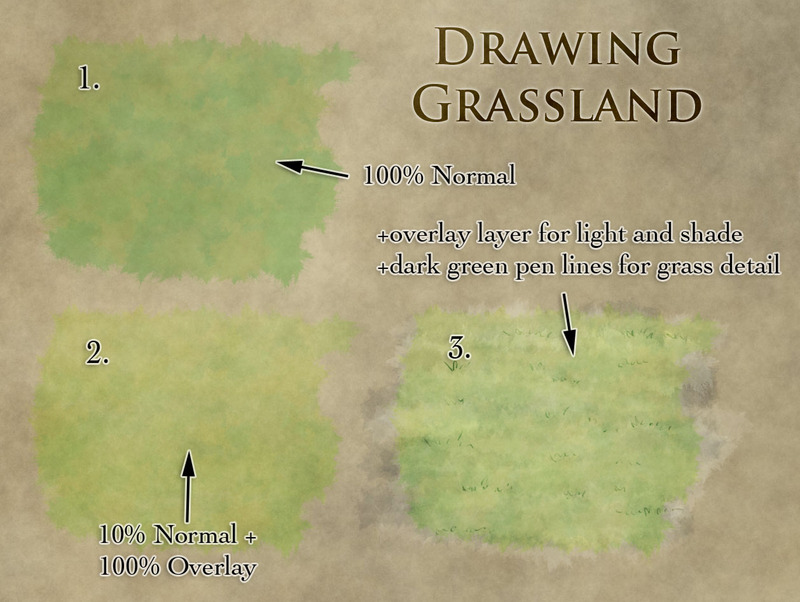 Grasslands are tricky to map. They’re large empty open expanses. 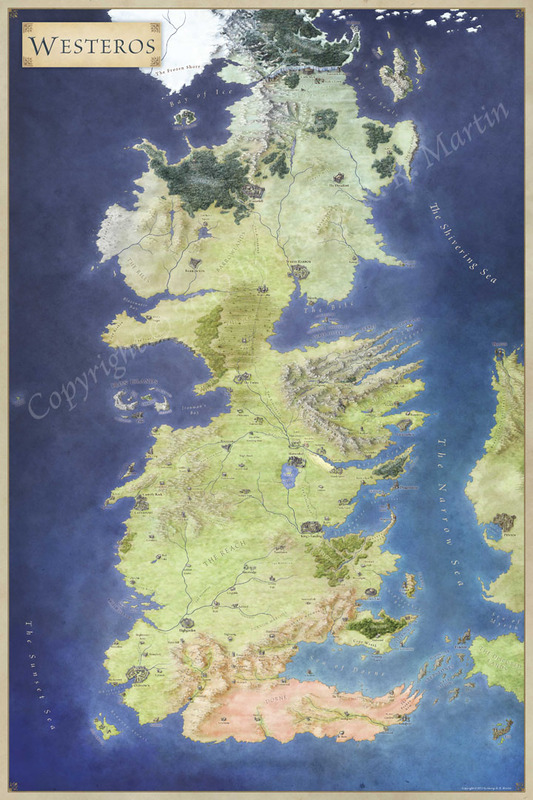 But if you just flood fill an area with light green it’ll stand out like a sore thumb against your beautifully rendered mountains and lovingly painted rivers and forests. The colour is tough too – you want it to be a light green without being fluorescent. Take two shades of mid-green and turn on colour jitter with Foreground/Background jitter set to 100% – this’ll give you a nice varying green, which helps to break up the monotonous uniformity of a green expanse. Use a large grungy brush (such as this case:https://plus.google.com/100445521601957994193/posts/gwxwfW6zYgM) and set it to low opacity (20-30%?) and block in your grassland. This should give you something that looks a little like 1 in the attached image. This is a little dark, and a little solid green for my liking – I like to let the background texture bleed through. Create a new layer over the top and set the blend mode to Overlay. First block in a dark blue with roughly 10-20% opacity. Use horizontal strokes – this will help to reinforce the isometric perspective of your map. This should give you some nice light/dark variation in your grassland without breaking anything. Finally finish it off with a few dark green grass tufts scattered around using a thin brush (2-3 pixels, or 5 px if you’re using a pressure sensitive stylus). If you’d like to check out the psd file for this, you can get it here. Feel free to share this around to anyone who might find it useful. As always, you can check out previous tutorials here. DUDE. I followed a link from Metafilter to get here, and MY HEAD ASPLODE. Thank you VERY MUCH for the cool tips and stuff–and ESPECIALLY for thinking of us GIMP users (’cause that’s how I roll). The only trouble is…now, how am I going to get any housework done? CURSE YOU UP SOMETHIN’ CRAZY, JON ROBERTS…!!! 🙂 Glad you’re enjoying going through the maps and tutorials! I started off using Gimp so I’m well aware of the trials that people can run into using it – but you can get some amazing results with it. Make sure to post the results over the Cartographers’ Guild when you’re done – it’s a great community and the best way to get informed constructive critiques. I just want to say THANK YOU! I’ve been working on many maps…and when looking up a how to tutorial, yours is always on top and exactly what i am looking for. Great up the great work and tutorials.